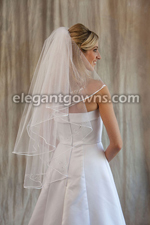 Ivory 1 Tier 33" long Rattail edge veil with rhinestone appliques. 72" wide on a 4" Satin covered comb. Please note veil shown is 2 tier 30" x 36" and is 72" wide & circular cut, veil for sale is 1 tier 33" long, 54" wide and standard cut. 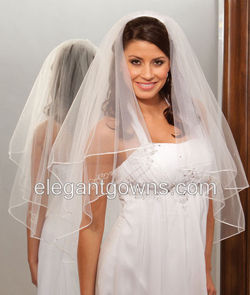 Veil pictured also has scattered rhinestones that are NOT on the veil for sale.